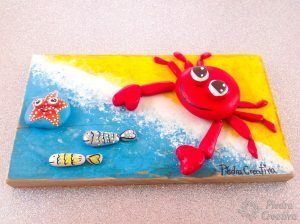 I have thought to make this craft of the red beach crab with vivid colors along with some fish and a starfish. 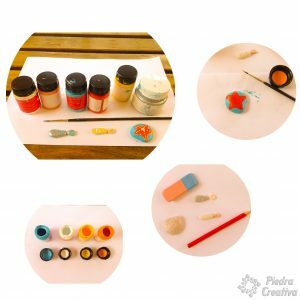 To complete this precious craft in painted stones, we have placed them on a piece of wood creating a lively and joyful atmosphere. Before you begin remember to protect the surface where you go to work. 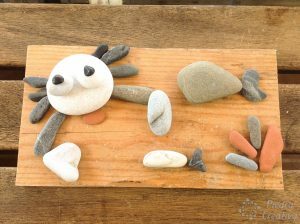 Wear old clothes in case you stains and enjoy picking up the stones to make the composition of your special beach crab. Wash all the stones well before starting to paint them so that the paint will grip well. 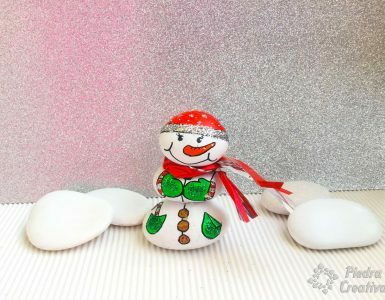 If the stones are dark, give a first layer of white paint, this way you will get the colors to shine and highlight more. a) How to paint the crab? 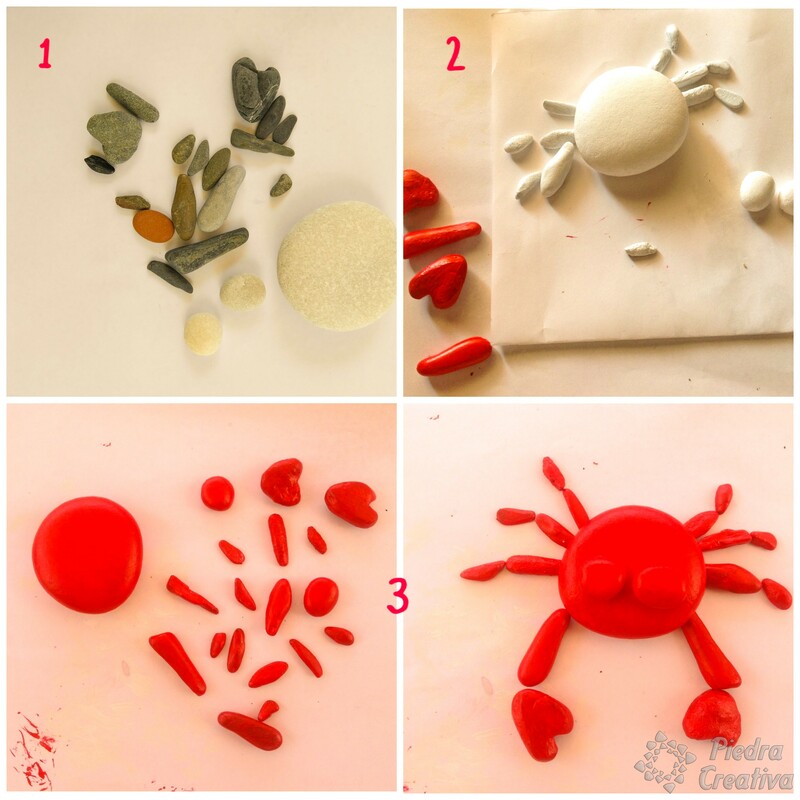 Apply a pair of acrylic paint hands (of the corresponding colors) to each pebble. For the body of the crab paints all the red stones. On the stones that we have chosen to make the eyes, paints some circles of white color. Then use two little black pebbles (or paint over the white color). To finish the eyes, put a pair of white dots to make the reflection shine. b) How to paint the simple fish in stones? To make the fish that accompany the crab, start by choosing some stones with an elongated shape for the main body. For the tails of these fish, use other small stones of a triangular shape. Begin by sketching with pencil softly. On this occasion, as they are very small, we do not need many details. If you want, you can use some pens and it will be easier for you. For details apply points, we have used a stick for it. c) How to paint the starfish? To create the starfish choose a flat rounded stone, in that stone we will paint our star. To give a more beautiful look we have painted dots on it. 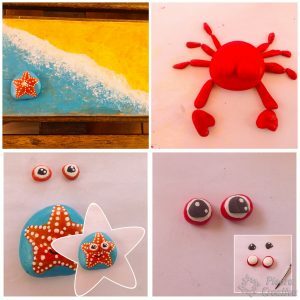 For the starfish, do the same as in the eye crab, but this time, paint again over the white making the pupils in black, remember to then apply the reflection of the brightness to make the reflection. Sand the wood with a sander or sandpaper (including the edges of this frame). Then clean the wood before painting. 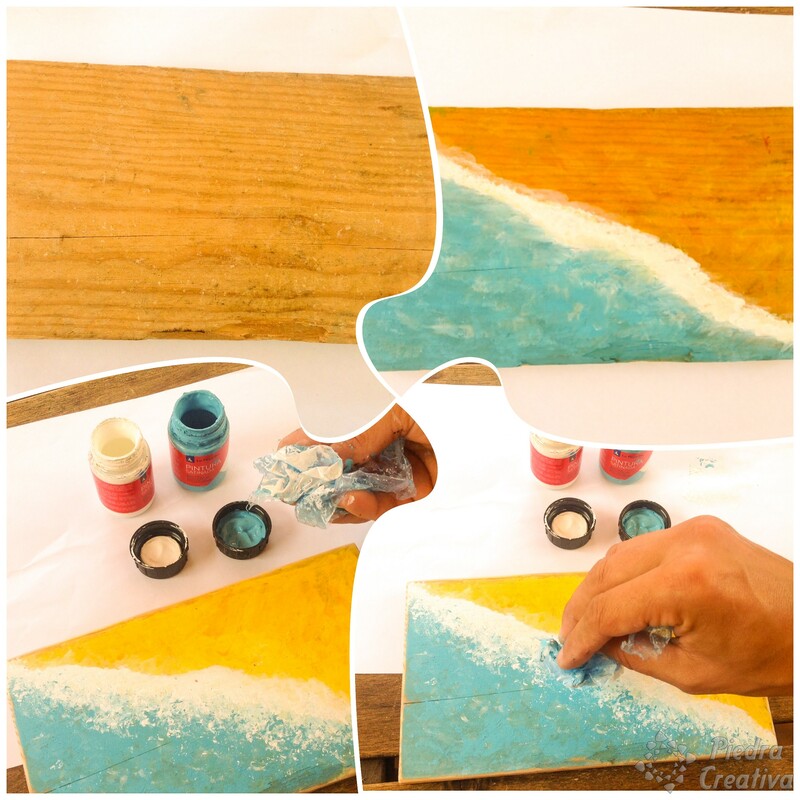 With the same acrylic paint for crafts, paint the sand and sea bottom of the painting. On top of it we will next place the crab like the fish and the star. To make the sea foam, take a piece of plastic and, with a little white paint, spread the piece of plastic on it and then move the paint to the wood. In this way (using the plastic) you will create a foam with a great realism. Place all the painted stones first, then paste them in the chosen place. Use a flexible glue or hot silicone. I recommend the glue better because it gives a better result. Once you have all the stones stuck, apply two layers of varnish. 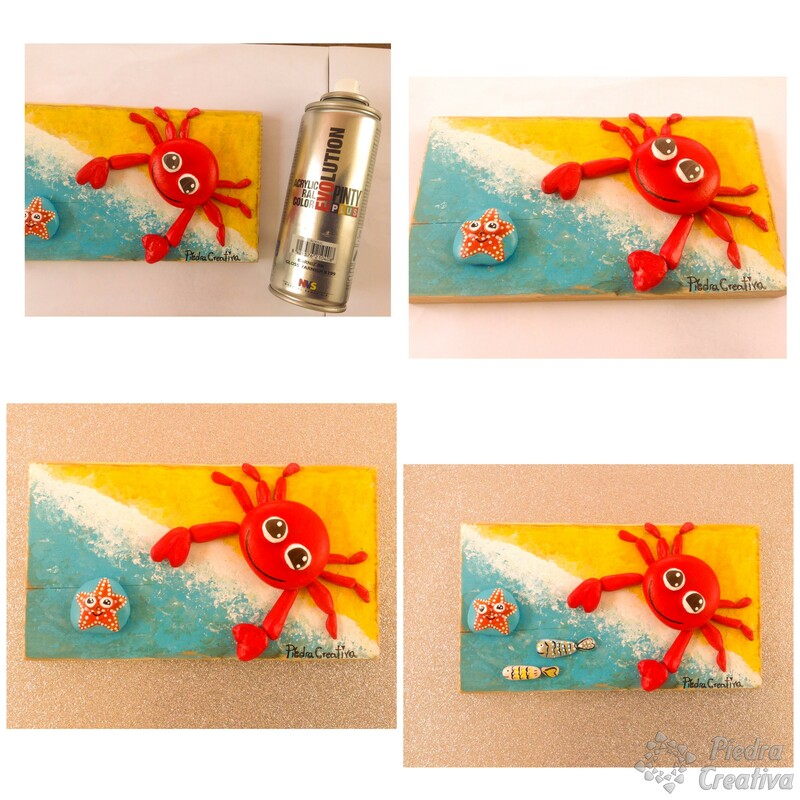 We love the spray varnish, but you can use an acrylic or some Decoupage type sealing glue. 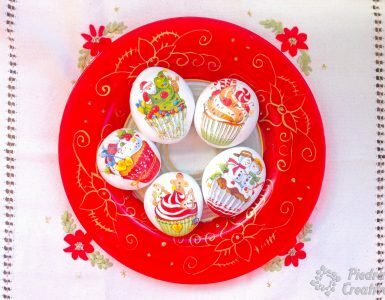 All you have to do is hang up this pretty picture of painted stones. To see other example you can do it I leave the link of cute pigs. We hope you have enjoyed this DIY of a red beach crab, and encourage you to do some of these beautiful crafts. 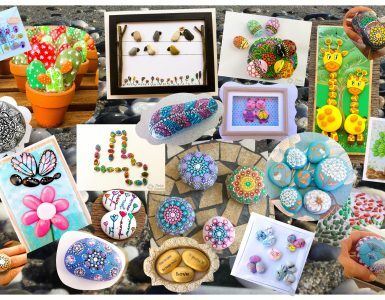 You can take inspiration from Pinterest because you will find many good ideas there or you can see other ideas of the sea like a variety of fish in stone. You can also try some simple manuality of the section Quick and easy.